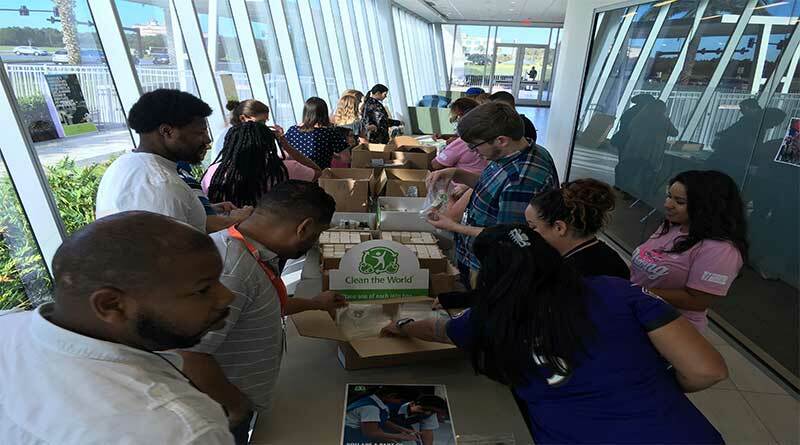 ORLANDO, FLA. (October 15, 2018) – Holiday Inn Club Vacations® team members built 2,000 Clean the World hygiene kits for residents of the Florida Panhandle affected by Hurricane Michael. Additionally, the company pledged $10,000 toward Clean the World’s Hurricane Michael emergency response efforts. Holiday Inn Club Vacations team members traveled to the area to deliver relief supplies and help their Panama City Beach team members whose homes suffered damage from the storm. Clean the World will deliver the hygiene kits to local community organizations in the Panhandle. “When natural disaster’s strike like the devastating events of Hurricane Michael, access to hygiene is critical and ongoing,” said Aleic Grant, Director of Corporate Social Responsibility of Clean the World. Orange Lake Resorts owns and operates two resorts in the area: Holiday Inn Club Vacations Panama City Beach Resort and Holiday Inn Club Vacations at Bay Point Resort. About Orange Lake Resorts Orange Lake Resorts encompasses 26 resorts and 7,400 villas in the U.S., with more than 340,000 timeshare owners and 5,000+ employees. Orange Lake Resorts, a leader proven success, operates the 2008 through a strategic alliance within Holiday with IHG Inn the ® Club (InterContinental vacation ®. The ownership Holiday Inn industry Club with Vacations more ®than brand three was decades created of in Hotels Group), one of the world’s leading hotel companies. Disney World The ®Resort, Holiday was Inn established Club Vacations in 1982 flagship by Holiday property Inn ® in founder Orlando, Kemmons Fla., located Wilson. next The to timeshare the Walt brand includes 26 resorts across 13 states. For more information on Holiday Inn Club Vacations or to book reservations, visit holidayinnclubvacations.com. Find us on Facebook at facebook.com/hiclubvacations or Twitter at twitter.com/hiclubvacations.